Monthly Maker Spotlight: Niamh Lyonhart of Lyonhart Bag Co.
We are featuring Niamh of Lyonhart Bag Co. for our April Maker of the Month! 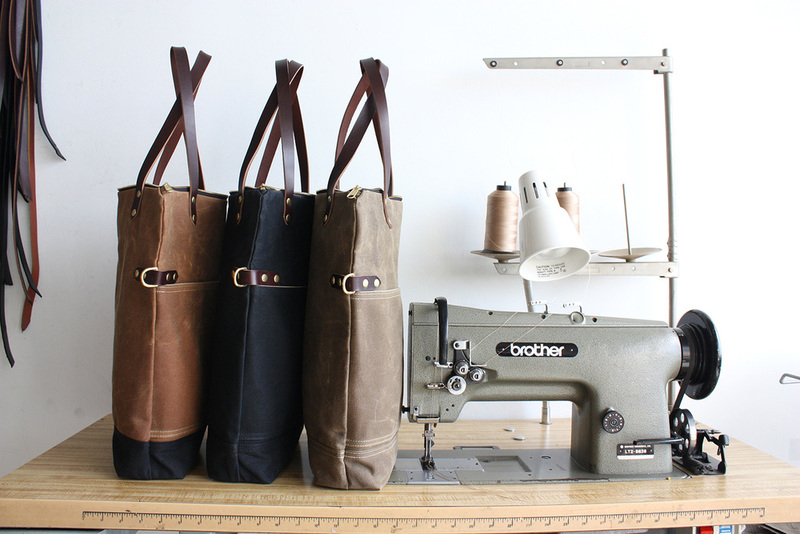 Many of you have seen these amazing bags in the shop and we have been honored to carry her line of waxed canvas bags for the last two years. Lyonhart Bags are extremely well-made, built to last, and are a great mix of masculine and feminine. These bags are all made by Niamh's hand in East Oakland. All of the materials that go into making these bags are sourced locally and domestically when possible. Niamh uses waxed canvas from Martexin, a family business that has been producing the fabric since the 1800’s. The leather comes from domestic cows and are sourced from a local California business. The hardware is solid brass and comes from another family business in the Midwest. We wanted to learn more about Niamh's artistic process and shared her answers below. When it comes to bag making my creative process is sometimes inspired by the gaps I see in mainstream fashion. Other times it has been inspired by my own needs and feedback from customers and friends. How long have you been making your bags? How did you start out? I've been making my bags for a little over 2 years now. Before that I was a professional seamstress sewing women's wear, mostly for other designers. I started out making bags when I made a couple for myself a few years ago. I wanted something that was more rugged than what I was finding in stores, but also something that was still stylish and feminine. Initially I made my own waxed canvas and had a local saddle and tack shop help me with the leather. Describe your current line and process. My current line includes some of the original designs I started out with, (though the patterns have been updated and improved in the last 2 years), some I've added a long the way, and I am just about to launch my SS16 line. The bags range from my Hudson Saddlebag Purse, inspired by vintage Coach handbags, to my Boat Builders Tote which is made with the craftsperson in mind and has lots of pockets for organizing hand tools. My newest bags include a smaller sized backpack, a shoulder bag, and a masculine tote bag. Why do you like living in Oakland? That's a hard question to answer! I absolutely love living in Oakland. I love that the weather is almost always perfect, and that there is so much to do outside. Oakland has everything a big city can offer, with the added bonus of beautiful regional parks and so much nature in close proximity. I love the thriving arts community, which is disappearing from a lot of major cities in the US, and I hope it can be sustained because the one thing I don't like about Oakland is the cost of living. What is your favorite spot in Oakland and why? I have so many favorite spots. Most of them involve either hiking or coffee. Right now I'm really enjoying adventuring through Mountain View Cemetery and Redwood Regional Park. For fun I like to hang with my husband and our dachshund, and go on adventures around the Bay Area. Check out Niamh's new website at lyonhartbags.com and her Etsy page here to see her full line of bags, backpacks, and purses. Also check out her Instagram @lyonhartbagco for all of her newest products as well as to see how adorable her dachshund, Greta, is!